A very crucial part in the production of video or animation is the storyboard stage. The team you hired to do your video will most definitely send you storyboard sketches or detailed storyboard to show you the visual ideas they have for the video. Unless you have worked in the creative industry or possess relevant qualifications, you might have a hard time understanding a storyboard and what to expect from it. A storyboard consists of rectangles known as “Scenes”. Each storyboard comes with dozens of scenes depending on the duration of your video / animation. For the sake of this article, we assume your video target length is 60-seconds (1 minute). On average, you can expect to see at least 15 to 20 scenes in a 60-seconds storyboard. Each scene is drawn to give you a glimpse of what is happening only in that particular scene. OMG These are All Static Images. Is This Going to Look Like a Slideshow? We get that a lot!. No, it will not be a slideshow. Every scene will be animated or filmed. Everything you see in each scene on a storyboard is merely a guide. For example, in the scene below from our sample storyboard (Made for Marler Clark), we see that there is a family standing in an outdoor area. It was just a static image but it was animated after our client have approved the storyboard. 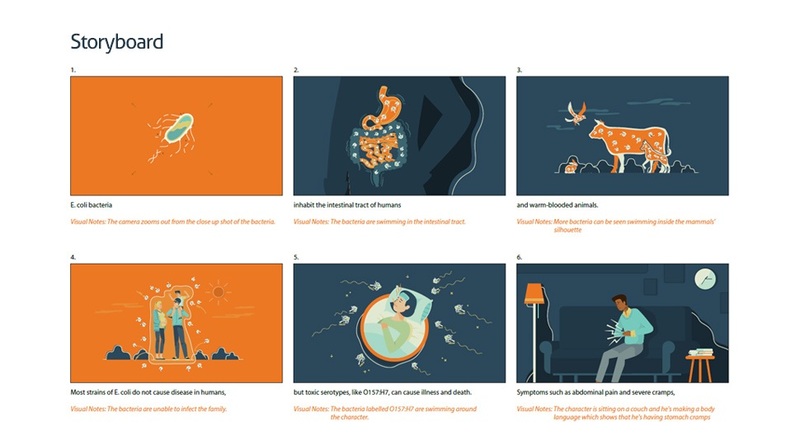 The idea behind creating this scene was to show that the bacteria are unable to infect the family as per the visual notes below it. The result is shown in the GIF below so you can see how this static image came to life and portray the message as we intended. Visual notes are very useful parts of a storyboard. They show what the animator or videographer plans to do with each scene. So if they want the character to jump after the call, it will be written below the aforementioned scene. There are some parts that the videographer or animator wishes to use zoom out or zoom-in effects. These are usually pointed by arrows on the scenes. So whenever you see the signs similar to the images below, you should know it’s about the camera movement. If the video comes with a narration, there must be a voice over line written below each scene. This helps you compare the visuals with the audio script and get a better glimpse. Ask the creators of the storyboard to make necessary adjustments to the scenes that you find unfit or wrong. It’s the best time to make changes as once everything is animated or filmed, making changes will be more difficult and often costly. Some storyboards come with transition scenes. Transitions are the parts that we go from one scene to another. The art of using creative transitions add value to an animation or video. There are conventional ways like jump-cut, fade-in, fade-out but in most cases it is advised to use a more creative approach. So if you wish to see something out-of-the-box, make sure to ask your vendor to show you or explain the transitions in the storyboard. This way you can have full control over the out-come. Typically, a storyboard comes in a black and white sketch format. However, more professional teams do have enough storyboard artists and designers to come up with more detailed storyboard in color. So if you are paying a premium for the project, you have every right to request for a detailed version rather than just a simple sketch. No creative work can be done in a short amount of time. It’s an awfully time-consuming process, so our advice is to allocate enough time for the creators of your storyboard or anyone making the video. Unless you have an event or other very serious reasons, there is no need to rush the creative team. Interpreting a storyboard is not exactly an uphill task if you follow the guide above. Bear in mind a storyboard only consists of static images, so remember to read the visual notes to better visualize the final result of your video.